Is Obama The Next Jimmy Carter? Polling still shows that many Americans like their new president. But polling also shows that the Democratic Congress, starting with an out-of-control House of Representatives, has managed in less than two weeks to create a scenario that could permanently cripple the Obama presidency. The mess of a so-called stimulus package it passed on to the Senate became toxic with critically important independent voters so quickly that now a rework in the Senate is unlikely to reverse the bill's unpopularity. More distressing for President Obama is that expectations of an immediate boost from stimulus legislation, which he has been desperately trying to manage, remain. And that's regardless of how many times the president warns that recovery will not come soon. But with so many organizations, state governments, special interests and scared and financially ruined people expecting relief, Obama has been placed in a no-win situation. In my book "Paranoid Nation," about the 2008 race for the presidency, I note many similarities between then-candidate Barack Obama and former president Jimmy Carter. And I certainly was not alone in drawing such comparisons. Carter, following the years of Richard Nixon's Watergate and Gerald Ford's pardon of Nixon, was viewed as an agent of real change. Like Obama, Carter's past political career seemed foreign to most of the media -- his southern-based political past looked small time and hard for the national media to grasp. Obama's meteoric rise from Chicago-style politics to a brief stint in the Senate left him an enigma to many as well. While Carter chose to enter the White House with a clear effort to avoid the so-called "Washington Establishment," President Obama has embraced Washington insiders in an effort to avoid amateur mistakes. But the amateur mistakes have come rolling one after another in the past weeks. And while a failure to properly vet big names for cabinet posts resulted in a confession from Obama that "I screwed up" -- his candor helps him in the polls -- the whole issue of flawed potential administration officials is merely a sideshow. The fact is that Barack Obama, while trying to meet a dire economic crisis, has fallen straight into the trap that led Jimmy Carter to defeat in his bid for reelection. Obama has sought to promise and do too much in too short a period of time in a city where Congress, federal departments and agencies, and bureaucrats can and will eat a new president alive. James Fallows, a former Carter speechwriter, wrote a May 1979 piece in The Atlantic in which he reflected on the first years of the Carter presidency. He noted that Carter promised during his first "fireside chat" that he would present the nation with a comprehensive plan to deal with energy independence "within 90 days." Fallows goes on to note that Carter later came to understand that strict deadlines could be destructive "in that they might force him to go ahead with half-baked ideas." Well, if ever there was a collection of half-baked ideas, it is the combination of George W. Bush's rushed bailout plan, which we now realize had no structure or oversight, followed up with Barack Obama's "infrastructure" effort to get people working with "shovels in the ground." That's now turned into the world's biggest collection of rubbish for not creating jobs. Carter had to deal with a tough and Washington-savvy house speaker, Tip O'Neill. O'Neill and Carter started off on the wrong foot when Carter's staff failed to give O'Neill the proper number of inaugural tickets he sought. Things went downhill from there. And on the Senate side, Ted Kennedy was licking his chops to challenge Carter, thus forcing Carter to more liberal positions than he was expected to take. Now Barack Obama has Speaker Nancy Pelosi, who, along with fellow Democrats, loaded Obama's bill with everything but the kitchen sink; and he has Harry Reid, who early on made it clear it was his Senate, not Obama's. 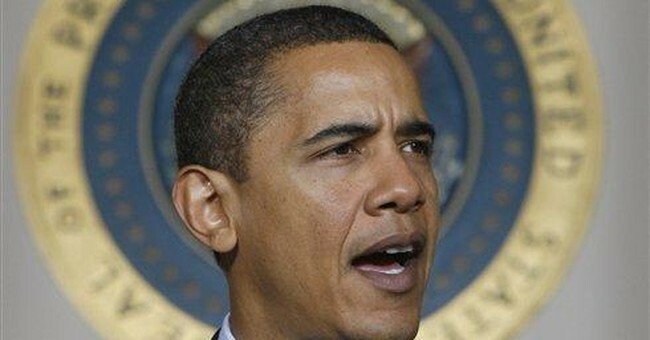 Now that the stimulus bill is in real trouble, Obama is trying desperately to pull back from the breadth of the bill. But it was President Obama's own words to NBC's Brian Williams this week that tells the true story. He told Williams that it was necessary to use the current crisis to force the nation to deal with long-term issues such as healthcare ... and energy. But wait: I thought Jimmy Carter had that one solved within 90 days after his first fireside chat. And look where he ended up four years later.